Thousands upon thousands of high-quality diamonds to choose from. GIA diamond grading reports. Amazingly competitive diamond prices. Money back guarantees, lifetime warranties, and 30-day return policies. It may seem that Blue Nile, James Allen, RockHer and all the big online diamond sellers are the same. 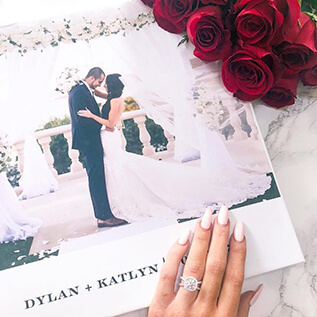 Online retailers have revolutionized diamond shopping by offering the best diamond prices, with lower markups and more selection than traditional brick and mortar jewelry stores. 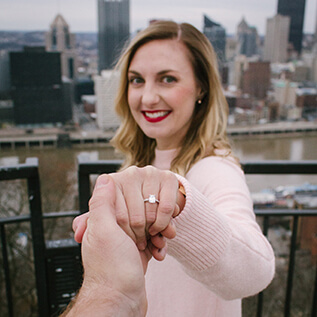 Blue Nile, James Allen, and RockHer have consumer-friendly policies and customer service, from the shopping experience to a hassle-free 30-day money-back guarantee with free return shipping. But you might be surprised to find that there are important differences when comparing RockHer vs Blue Nile vs James Allen. Blue Nile and James Allen have more than 150,000 loose diamonds to choose from, more than other online diamond retailers, but they include some diamonds that most diamond experts would never recommend buying, no matter how low the price. Raw numbers don't tell the whole story. 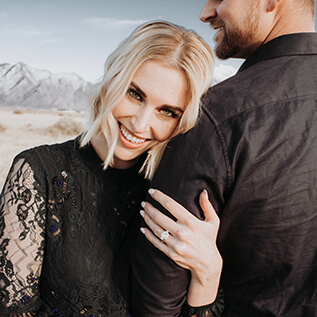 Here are the four most important reasons why shopping on RockHer can help you find the perfect diamond engagement ring, even if you don't end up buying your ring from us. Ok, you’re ready to find the right diamond for you. In the past, you’d go to a local brick and mortar jeweler and look at maybe 20 loose diamonds and choose the one that you liked best. Seems crazy today, when a large online retailer like Blue Nile or James Allen has more than 1,000 times the number of diamonds to choose from, right? But here’s the thing: that local jeweler chose those 20 diamonds. They put their money down and picked the 20 stones they thought were the best diamonds on the market. They didn’t pick lemons. Of course, if you wanted a different size or shape or cut, you were out of luck. It was difficult to comparison shop to find the best diamond prices. And you paid for the jeweler’s overhead and investment of time and money in higher markups. Today, large jewelry store chains are another option. Large chain jewelry stores have the same overhead as local jewelers but they don’t pick every diamond they sell individually. 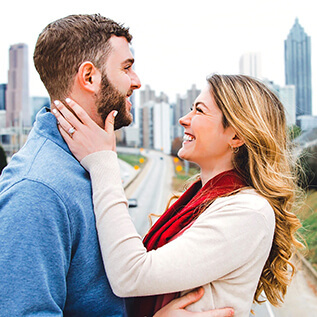 They sell complete engagement rings made overseas in such large quantities that the color, clarity and even carat weight vary from ring to ring. You’ll only get an estimate or quality and carat weight. A one and a half carat solitaire engagement ring can have a diamond that weighs only 1.45 carats. You still can’t comparison shop easily and you’re still paying high markups. That’s why many people today buy loose diamonds online instead: the markups are much lower and it’s easier to comparison shop. But it does take more work. Online diamond retailers like Blue Nile and James Allen outsource the expertise of picking a loose diamond to you. You are expected to do the research to educate yourself to be a diamond expert and DIY diamond buyer. The 150,000 online diamonds James Allen and Blue Nile list on their websites are the entire stock of big wholesalers and cutters overseas. A lot of good diamonds, sure, but also lots of not-so-good diamonds. Many of these diamonds are the ones an experienced jeweler would never buy because they don’t look good in person. Which is which? When you are diamond shopping, combing through page after page of listings, how do you avoid the lemons? Why are some online diamond prices lower than others with the same grades? What’s wrong with them? It’s up to you to figure that out. Blue Nile doesn’t even see the diamonds it sells to you, they are drop shipped from vendors. And James Allen includes listings with IGI diamond grading reports, which don’t command the same respect as GIA diamond grading reports, making it difficult to compare prices and quality. Most diamond experts don’t recommend buying diamonds with grading reports other than GIA or AGS. Although you can learn a lot by researching diamonds online, you don’t have the experience of looking at thousands of loose diamonds to see what all the small differences in color grades, cut grades, proportions, and locations of inclusions really mean when you are looking at diamonds in real life, not in images blown up to paperweight size in controlled lighting. Will a diamond that looks the best in a video look the best in your own ring when you are looking at it in your home or office? It’s a gamble. RockHer is different than Blue Nile and James Allen because we built a diamond-picking artificial intelligence called ROSI using all the combined knowledge of scores of diamond experts. Using the power of IBM’s Watson, ROSI can sift through the hundreds of thousands of loose diamonds on the market at any one time and find the most beautiful well-cut eye-clean diamonds in your budget. You don’t have to look at bad diamonds: they are automatically filtered out. ROSI compares more than 30 different criteria and diamond prices to find the highest quality diamonds that are the best values. It’s not just an easier way to comb through the options and find the best choice, it’s the best way to get the value of online diamond retail while making sure that you don’t buy a lemon. And then we did it again with the new ROSI Personal Ring Shopping Tool, calculating the combined cost of diamond and ring setting so you can compare the total cost of different complete engagement ring options. To do that, ROSI compares 300 million options to find you the best diamond and ring setting for your budget. It’s the most sophisticated engagement ring shopping technology in the world. 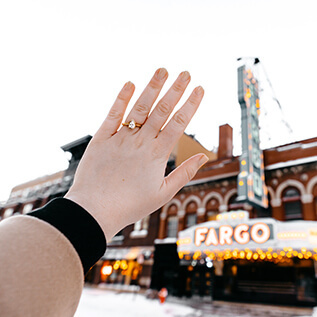 At RockHer, unlike Blue Nile and James Allen, the engagement ring you select will be made to order expressly for you, from scratch in one piece, to fit your diamond and your finger size precisely. We use the latest CAD/CAM technology combined with skilled hand-finishing in our Los Angeles workshop to craft engagement rings to the highest possible quality standard for fine jewelry. This is very unusual today: most online retailers like Blue Nile and James Allen (and offline retailers too) have stock ring settings on the shelf in a standard size and alter them to the ring size you order. Then they solder on a stock diamond setting in the size and shape that fits the diamond you choose. This saves them money because the stock rings and diamond settings can be inexpensively mass-produced. It also helps them ship your ring very quickly: for diamonds it has on hand, Blue Nile can ship the same day. There’s no way to cast a ring from scratch that quickly. Why does RockHer make rings one-by-one in our own workshop to your specifications instead? We think it’s the single most important way to improve the quality of your ring. If an off-the-shelf mass-produced ring is heated, bent, and cut so it can be altered to your ring size it’s much more likely that side stones will fall out. That free sizing offered by online retailers has a hidden cost. And if the center stone setting isn’t made specifically for your diamond, the prongs can loosen over time and the diamond could fall out and be lost. Read the reviews from other retailers and you’ll see that the most common issue that makes customers regret their engagement ring choice is stones popping out. Don’t just consider how a ring setting looks: make sure you ask about how it’s made too. You don’t want a setting that requires constant maintenance like prong tightening. Responsible sourcing of the center diamond of your engagement ring is important. Most major retailers abide by the Kimberley Process to ensure that all conflict diamonds are eliminated from the supply chain. But at RockHer, that’s just the beginning. We pay attention to the sourcing of all the diamonds in your ring, not just the center stone. We are partners in Lipari Mineraçao, which operates the largest diamond mine in South America, the Braúna mine in Brazil. All the small diamonds in our engagement rings are sourced from Lipari, providing jobs and economic security for the people of Nordestina in Brazil. In addition, unlike Blue Nile and James Allen, RockHer uses 100% recycled precious metals in all our engagement rings. Making all our engagement rings from scratch in our workshop in Los Angeles means we can control every aspect of the process to make sure it is done responsibly. When you get to the bottom line at the end of the process and you are ready to buy what you think is the right diamond, there’s one more step that can give you the peace of mind that there isn’t a more beautiful diamond or a lower diamond price out there that you haven’t located yet. No matter where you found your diamond, RockHer or Blue Nile or James Allen or even your local jeweler, you can use RockHer’s unique Diamond Value Check tool to confirm that your diamond is the best possible choice. Here’s how it works: just put the GIA diamond grading report number into the Diamond Value Check tool and let ROSI, our diamond-picking AI see if she can find a better diamond for the same price or a similar diamond for a lower price. If your diamond is the best option, you’ll know right away. If it isn’t, you’ll see a few options that might be better. Basically, it’s the automated version of a second opinion. You’ll get the confidence you need to pull the trigger on a diamond you’ll be proud of forever.